I urge you all to read the detailed IBM proposal, and to contribute any ideas you may have on how to take this project to the next level. Personally, I can’t help but see a convergence between WaterOrg, and some of the broader efforts to organize and centralize sustainability solutions, such as discussed in our earlier thread on green wikis. I am comfortable with blogging. It is what I know, and past the initial hurdle of setting up a blog, which by the way is very low, it’s been smooth sailing ever since. I like the feeling of being in control, and of having all my stuff in one place. When I contribute to other blogs, it is usually a boost for my recognition and helps enlarge my audience. Contributing to other blogs is a no brainer; hardly any setup is required, and I usually do a slight rewrite to address issue of duplicate content. I love the creative freedom of writing whatever I want whenever I want. My blog is also a social place to meet cyberfriends I have made along the way, and who keep coming back for more discussions. I get tremendous satisfaction from direct feedback from readers, particularly when something they read on my blog, either from me or other readers, is making an impact on their thinking or behaviors. There is lots of reciprocity going on amongst bloggers, thanks to linking, trackbacks, and pingbacks. As a result, the give and take feels very fair. Although I am very familiar with wikis, have consulted for wiki startups, and have started several private wikis of my own, I find making the move from blogging to contributing to public wiki platforms a huge step. First, there is the issue of time. If I could somehow export content that’s already on my blog, automatically, I would consider it. Second, is the problem of attribution, and ownership of content. Although, I am not one to hang on to my creative product with steel claws, it is very important to me that I be given credit for it. Third, is the issue of duplicate content, and how that might affect ranking of original content with search engines. If content is going to be exported automatically, and frequently, I would not have the time to do rewrites to avoid duplicate content problem. My blog is not my only source of content either. There are quite a few projects I have been working on, that are sitting either in some files on my desktop, or in Google groups discussions, and that I wouldn’t mind sharing, if I could just turn those over with one click. The bottom line is, if you want my content, make it super easy for me, and make sure I get credit for it. I will end by sharing my dream of the perfect sustainability wiki. 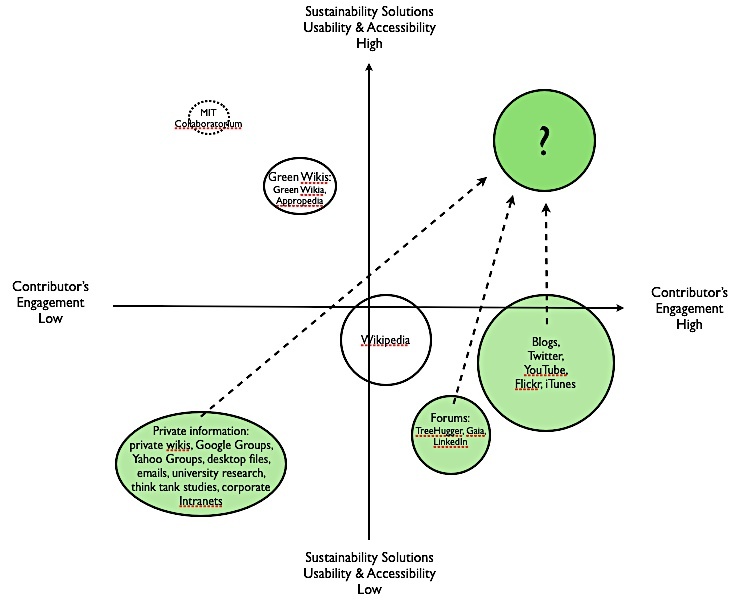 Imagine a place where you can find nearly all that has been published about sustainable solutions all over the world. Imagine that contributors would not have to worry about adapting their content to the specific wiki requirements. Wiki editors could take care of that chore. Imagine that contributors could get credited each time, with ample linkage back to their original websites. Imagine a widget that would allow contributors to send their content automatically to the wiki in one click. Imagine that getting my content on the wiki would be all benefit for me, in addition to the reward from helping the greater community. Imagine . . .
Maybe this discussion can be continued at the upcoming Open Sustainability Network Camp that will take place in October, in San Francisco? A more natural strategy is to build a system that has enough value without network effects – underlined by me –, at least to early adopters. Then, as the number of users increases, the system becomes even more valuable and is able to attract a wider user base. Joshua Schachter has explained that he built Del.icio.us along these lines – he built an online system where he could keep bookmarks for himself, such that even if no other user joined, it would still be valuable to him. It was relatively easy to build up a user base from zero because early adopters found enough value in the system outside of the network aspects. Makes sense, doesn’t it? On line, I am not social just for the sake of being social. There needs to be something in it for me. Videos on YouTube, insiders’ info on Twitter, objective book reviews on Amazon, a place to show my stuff on Facebook, bookmark storage on del.icio.us, interesting stories on diggs, etc. In other words, there needs to be something worthwhile spreading in order for the network effect to take place. The main lesson for me was probably that the technical engineering is relatively straightforward compared to the social engineering – underlined by me – In other words, it’s not enough to merely provide a nice platform and interface. You have to account for social factors – underlined by me – as well. Few people will try something completely off their own bat – they need to be personally introduced to it. At heart, we are still apes and we learn by copying. Getting the visible endorsement of the group leaders is probably essential to getting group adoption. Think Scoble/TechCrunch and Twitter. Embedded in Simon’s comment are two very important points. First is the need to not just push a technology, but also to take into account the psychological aspect of ‘the user’ and also the community. I have noticed lots of social networks get started by developers with no understanding or appreciation of that essential dimension of any social venture. Second is the need for the nascent network to receive the validation of one or several recognized or credible leaders. I know I always look for the personal story behind any new network. Who started it? What are thought leaders saying on Twitter? When cuil came out a few weeks ago, it only took a few negative tweets from the few social media gurus I follow, and a quick, unsatisfactory trial, for me to ban it from my toolbox. We are very much like cockroaches in that respect! Thanks Jonathan, thanks Simon, for teaching me a few things about social networks . . .
Kevin Beacon‘s 6 degrees of separation theory was confirmed, with a slight correction. Microsoft research found that the average degree of separation between any two random individuals, is actually closer to seven. This further validates the LinkedIn model, beyond business and professional search applications. From the report: ‘We found strong influences of homophily in activities, where people with similar characteristics tend to communicate more, with the exception of gender, where we found that cross-gender conversations are both more frequent and of longer duration than conversations with users of the same reported gender.’ A confirmation of what you and I know from our daily interactions. Humans tend to hang out with people who are like them, in terms of interests, and demographics. The more virtual networks facilitate such connections, the more likely they are to succeed. Think Facebook with its educated college crowd, or lesser known Patients Like Me. Next comes the question of how to apply these findings to existing and future social networks. To date so called green social networks have failed to generate substantial and enduring followings. Maybe this will shape a new wave of networks, more effective and in touch with the reality of the people. Will Next Climate Solution Come From InnoCentive? It was only a matter of time before open source made its way to science. InnoCentive has made the jump, and quite successfully, according to today’s article in the New York Times. InnoCentive connects companies, academic institutions, public sector and non-profit organizations, all hungry for breakthrough innovation, with a global network of more than 145,000 of the world’s brightest minds on the world’s first Open Innovation Marketplace™. Cross-pollination and crowdsourcing, all wrapped up in one place for global problem solving, I love it! The world has never been smaller . . .